Bangladesh Family Planing Job Circular 2015 | dgfpmis.org. Directorate General of Family Planning under Ministry of Health & Family Welfare has published a job circular on 6 May, 2015 for various post. 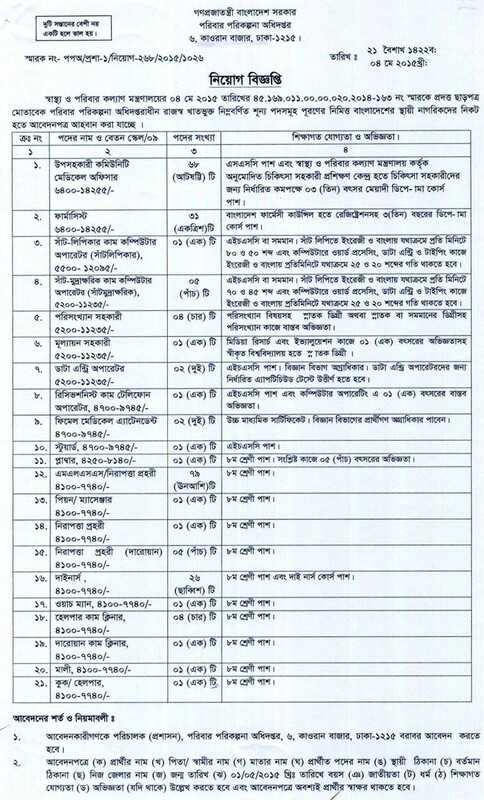 There are a lot of vacancies in Bangladesh Family Planning which will be fulfilled through this circular. The interested candidates are being invited to apply within 16th June 2015. Application Start: 6 May, 2015. Application End: 16 June, 2015. Name of Post: Sub Assistant Community, Pharmacist, Copy-writer Cam Computer Operator, Paste- Typist Cam Computer Operator, Assistant of Statistics, Assistant of Valuable, Data Entry Operator, Receptionist Cam Telephone Operator, Female Medical Attendant, Stuart, Plumber, MLSS/Security Officer, peon / Messenger, Security Officer, Security Officer (Guard), Dye- Nurse, Watchman, Helper Cam Cleaner, Guard Cam Cleaner, Gardener and Cook / Helper. Educational Qualification: Honours/HSC/SSC/Class 8 Passed. See the details in circular below. Salary: According to the post. Age Limit: 18-30 years up to 1 May, 2015. [18-32 years for Freedom Fighter and their cildren]. Age should not exceed 30 years on 16 November, 2014 for any post. Apply to “ Director” (Administration)- Directorate General of Family Planning, 6, Kawran Bazar , Dhaka -1215. See the details in the circular below. Family Planning written exam date has not been finalised yet. We will update when it gets published. Family Planning exam admit card will be found here. Like Our Facebook Fanpage facebook.com/resultnotice to get the latest updates of Family Planning Job, Family Planning Exam Date, Admit Card and Family Planning Exam Result 2015. 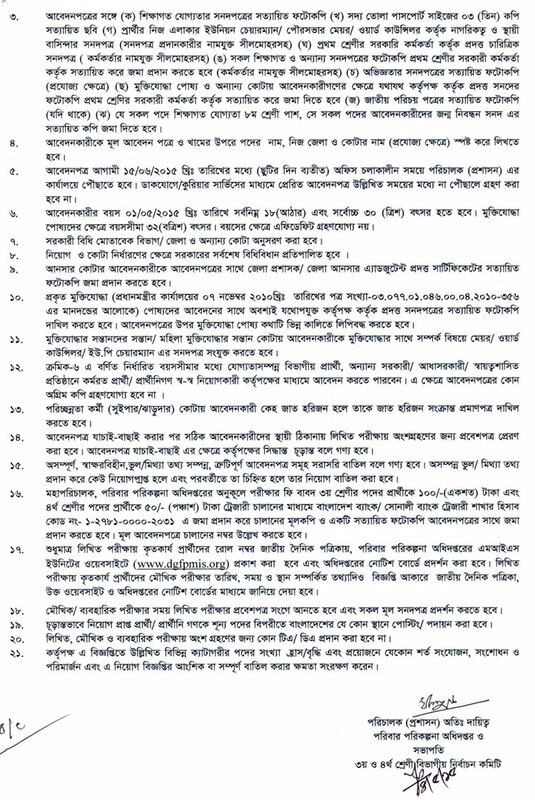 This entry was posted in Job, Job, Job Circular, Notice and tagged Bangladesh Family Planning Job 2015, DGFP Circular 2015, dgfpmis.org, Family Planning Exam Viva Result 2015, Family Planning Exam Written Result 2015, Family Planning Job Circular 2015, Family Planning Job Exam Admit Card 2015, Family Planning Job Exam Date, Family Planning Job Exam Result 2015, www.fpab.org.bd by Result Gov BD. Bookmark the permalink. Why the Government needs to do the job test? The maximum candidate get their job by using evil ways. If you have money, You have job. Not only normal job but also Government job. This is the hard reality of independent Bangladesh.